Hello Friends. The Christmas season is in full swing here at the house and studio. This evening is my husband’s annual Christmas party, which we host here at the house. This year (under advisement from my daughter in the UK) I am making Beef Wellington. I had my IPad set up on the counter top and had Gordon Ramsey at my side while I seasoned and seared, wrapped and rolled. What would my Mother say, as cooking now has a chef in your kitchen to walk you through the steps. As I was watching this world renown chef instruct me as to “how to”, I thought about all the videos on the internet that teach us “how to”. 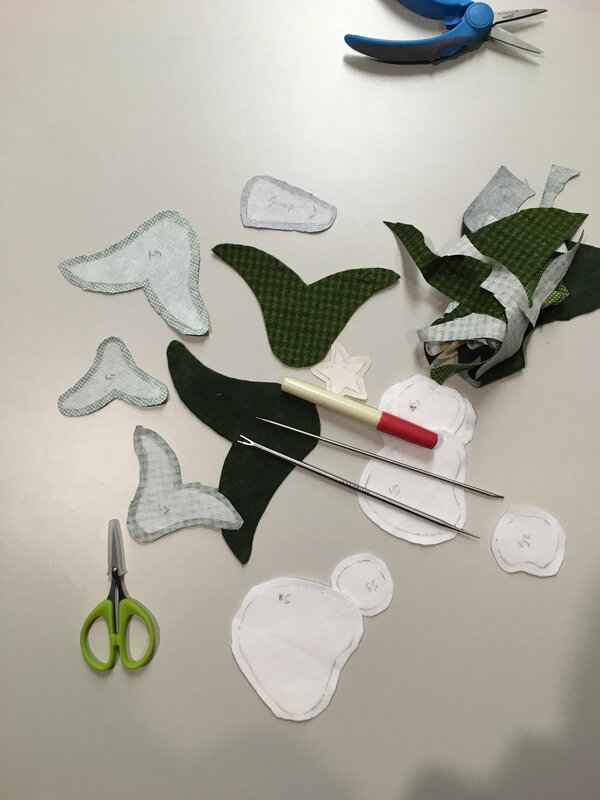 There is virtually steps for everything from build a house to make units for quilts. I also realized that even though the instruction is at our fingertips, we still have that ability to misinterpret and make mistakes. It is not like Gordon is going to jump out of my IPad and say, “just a minute Carla, that beef is not rolled tight enough!” Is this the most accurate way, or the best way to do something that will lead us to the best results. So, my conclusion to this cooking experience is anyone can make a video and anyone can tell you “how to”, but it doesn’t mean it is always the best approach for success and does not always make up for someone being by your side watching for those errors that are unexpectedly make in the process. 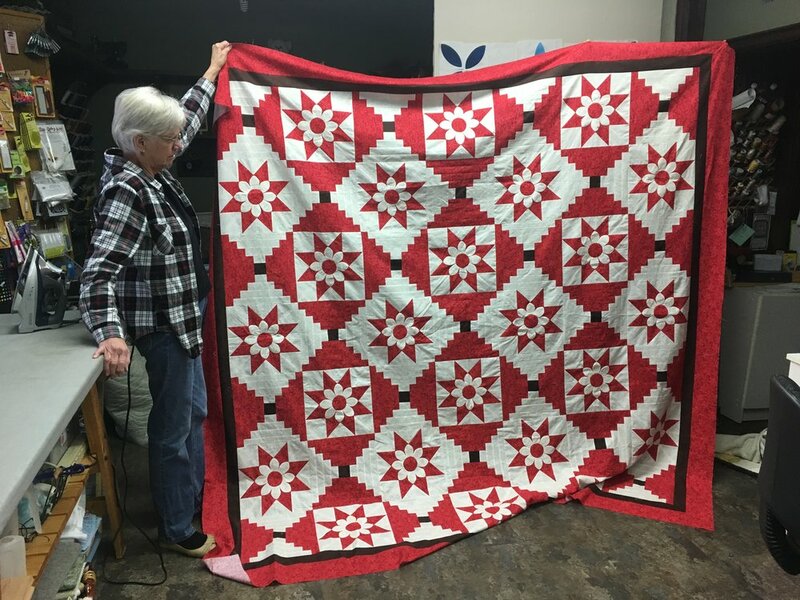 Over the years I have posted about the quilt that I make for one of the staff at my Hubby’s office. 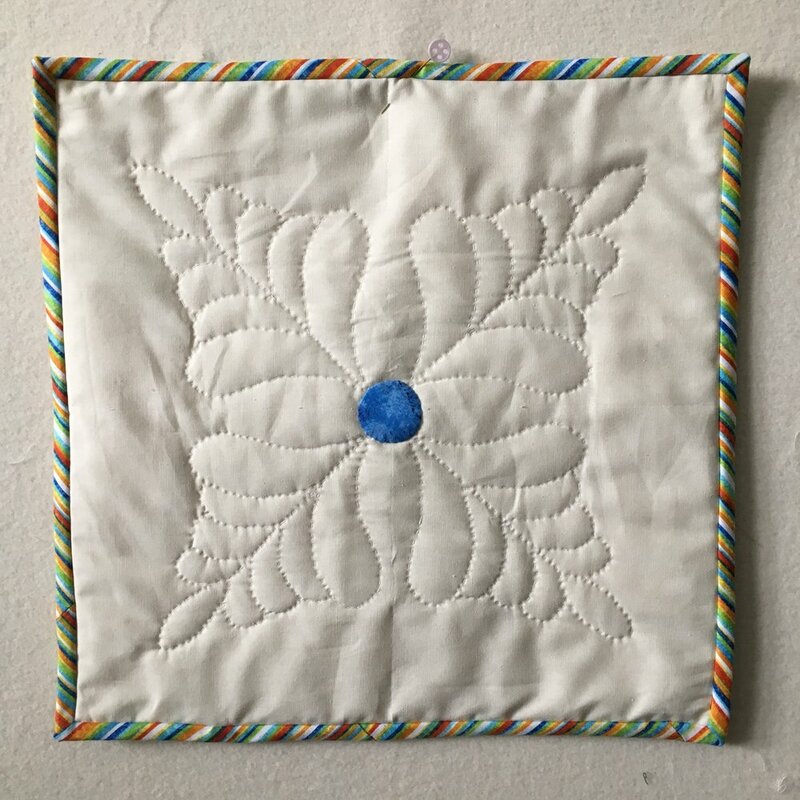 Well once again I have left this years’ quilt to the last minute(Ahhh!). Hey what fun would Christmas be if you were not behind in something! 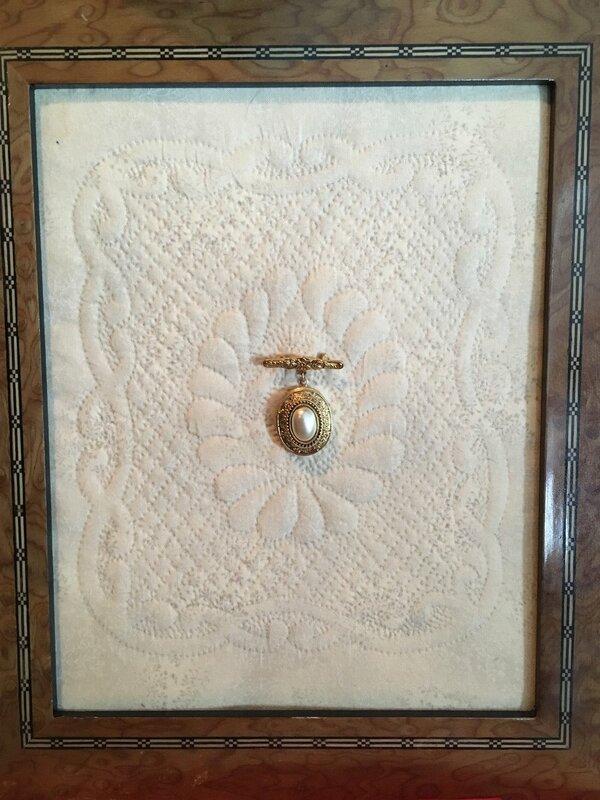 The pattern is called Love Links (pattern by Studio 180 Design™) and it is made solely from flying geese units. 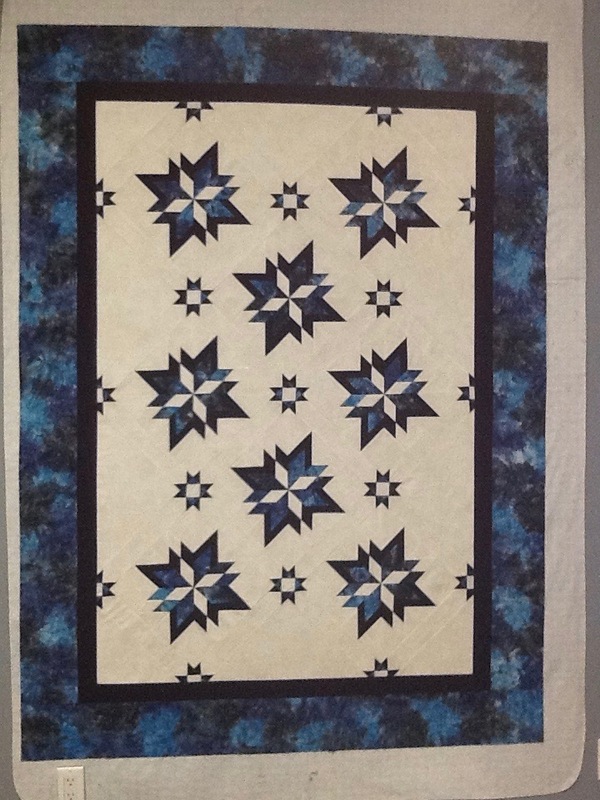 Gotta love that Wing Clipper tool™ to make this quilt any size and with points. 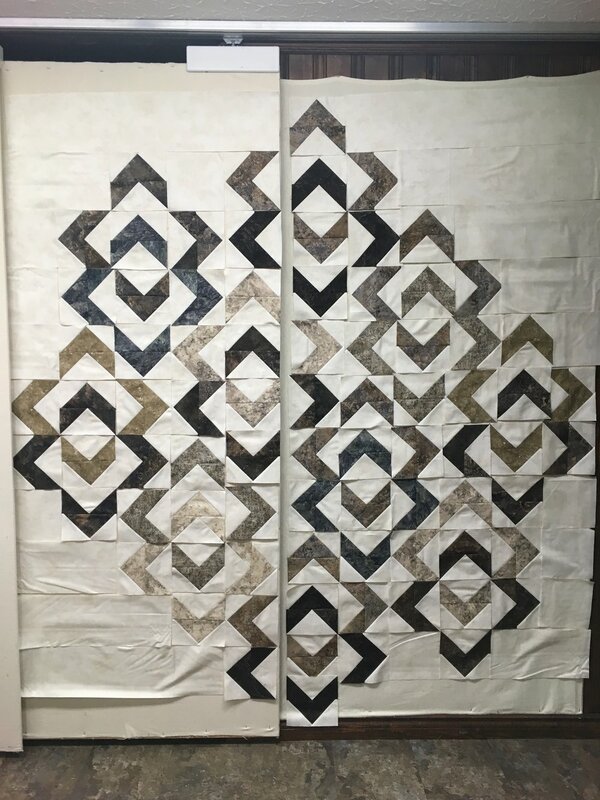 It is not sewn together yet, but on the design wall for her viewing and that will just have to do. I am all done my out and about teaching for a few months. The last few weekends I have been in Sturgeon Falls O, at their local quilt shop “Diane’s Creative Elements” teaching a few classes. 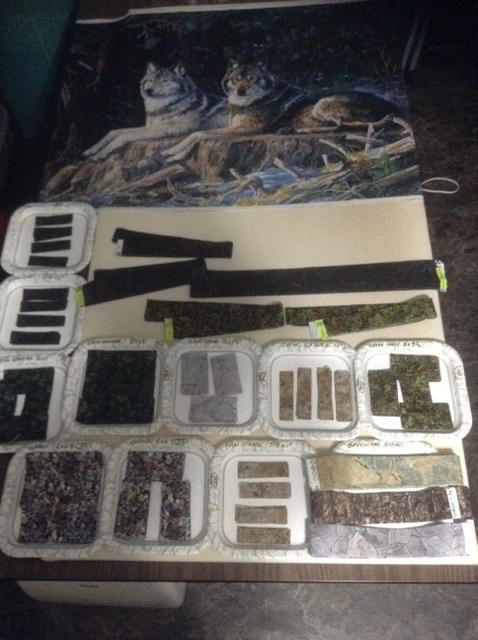 Last weekend the quilters played with some busy print fabric, the Rapid Fire Lemoyne Star Ruler and a technique called “Fussy Cut Lemoynes.” Here is just a few of the blocks. 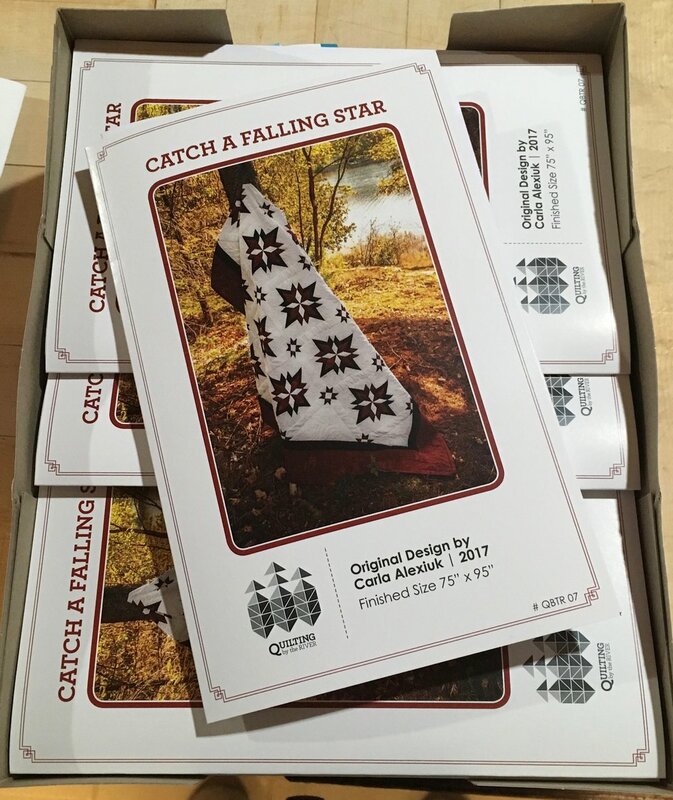 Once we are on the topic of Lemoyne Stars, my most recent pattern, “Catch a Falling Star” is ready for sale. I welcome shops to contact me for wholesale inquiries and general quilters can email me for their copy of the pattern. 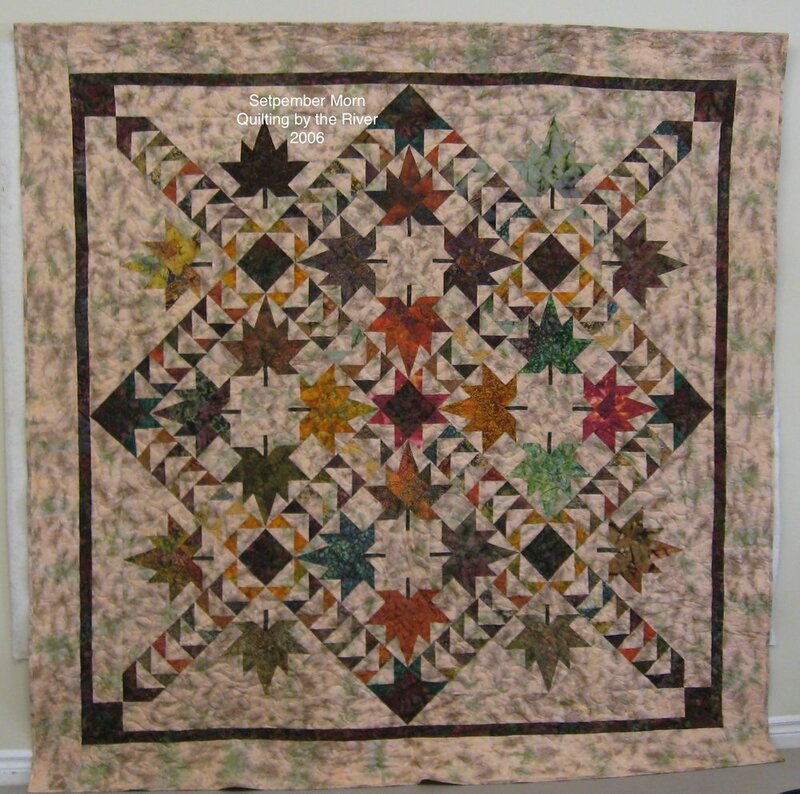 I have had a few quilters from the Workshop in November, send pictures of their tops they finished. Keep them coming so I can share your creations. As the weather turns colder and darkness sets in earlier every evening, I find myself doing more hand work in front of the television. I have a few projects in que. My newest project is “Oh Christmas Tree”. 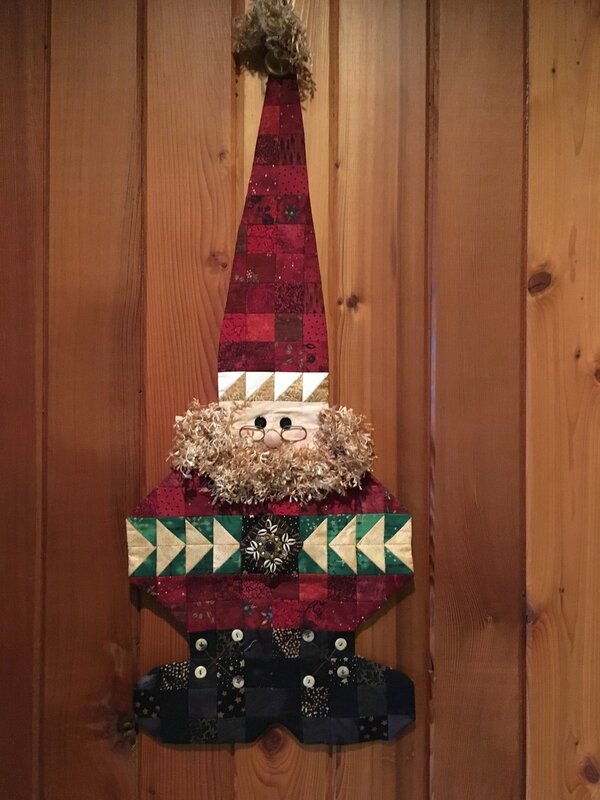 I love snowmen, so this fits in nicely to the winter décor in the house. I have used Apliquick interfacing even though the fabric is flannel and a bit thicker then plain cotton. It has turned nicely with the assistance of the Apliquick tools, and I find that hand stitching the pieces on has been quite easy. The thicker fabric hides stitches, making this project quite relaxing. I am using Superior “Kimono silk thread and Bottom Line (60 weight) thread for stitching. These threads are very fine and sink into the fabric. I have also been making this French braid tree skirt that I fell in love with a few months ago. I had to buy the book, because I saw the tree skirt on Pinterest and fell in love. That darn Pinterest! Ug! I am appliqueing a circle on top of the hole and making it a table topper instead. 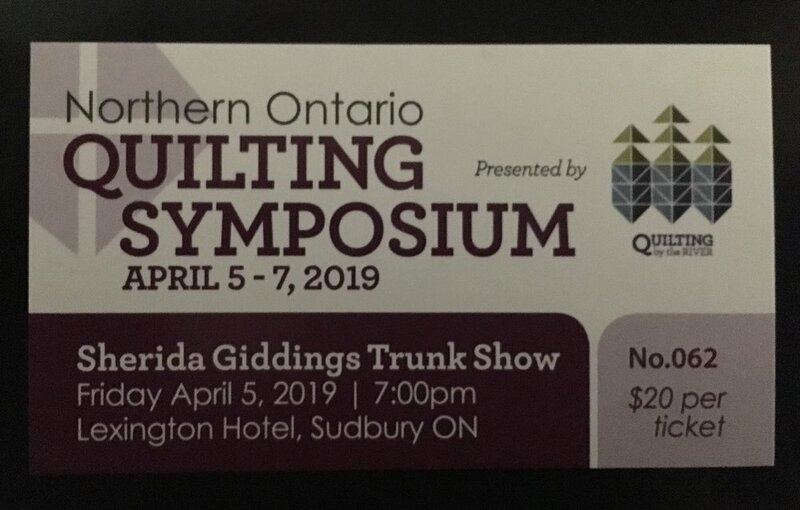 Now I just have to get it quilted – for next year? Well it is snowing like the dickens outside and a little part of me is a bit nervous and hopes that Mr. Winter does not make driving a problem for the Christmas party tonight. I have way too much food in the house to even consider cancelling. The Lovely Ladies of Lemoyne! Hello Friends. With 2014 nearing its end, I can't help but reflect on the classes that I have taught this year. More then that, the wonderful people that I have had the good fortune to spend time with and share my passion. Last weekend was no exception. Once a month a group of enthusiastic ladies gather together to explore the many creative possibilities of the "Rapid Fire Lemoyne Star Ruler". Here, a few brave soles gathered to show off their "Banded Lemoyne Stars". I so enjoy the laughter, recipes and stories that we get to share. We will resume again in January to continue the journey. Till next time, thanks for dropping by. Remember as this busy month gets underway, take a few moment for yourself, to enjoy the sights and sounds of the season.